The National Council honored Ambassador John Abizaid ahead of his departure for Saudi Arabia. 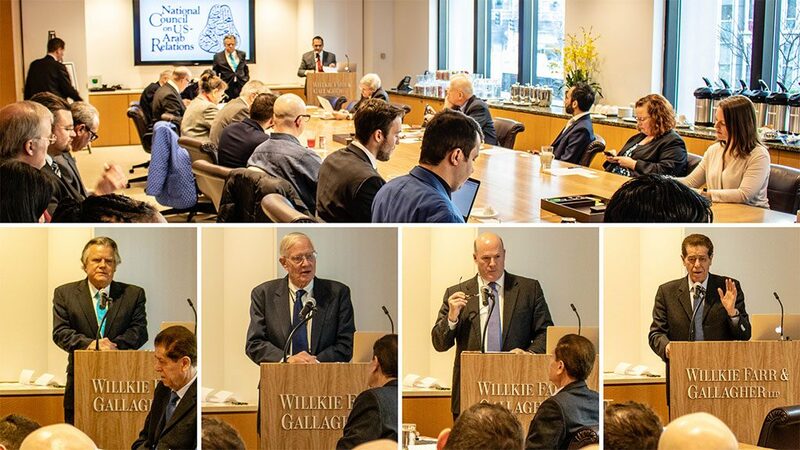 On April 15, 2019, the National Council on U.S.-Arab Relations was honored to host an evening discussion with newly-appointed United States Ambassador to Saudi Arabia John Abizaid. 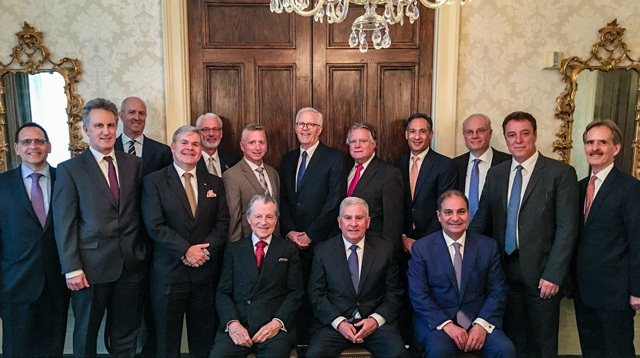 Attendees from the National Council included Founding President and CEO Dr. John Duke Anthony, Chairman John Pratt, and Executive Vice President Patrick Mancino. 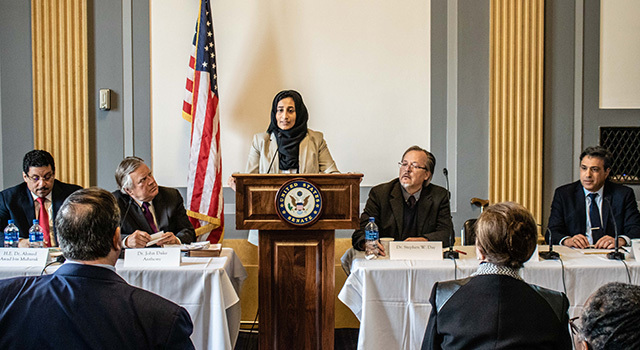 Joining the discussion were State Department Deputy Assistant Secretary for Arabian Gulf Affairs Timothy Lenderking, LEO A DALY Chairman and CEO Leo A. Daly III, Chargé D’affaires of the Saudi Arabian Embassy in Washington Sami Al-Sadhan, and select American private sector leaders. 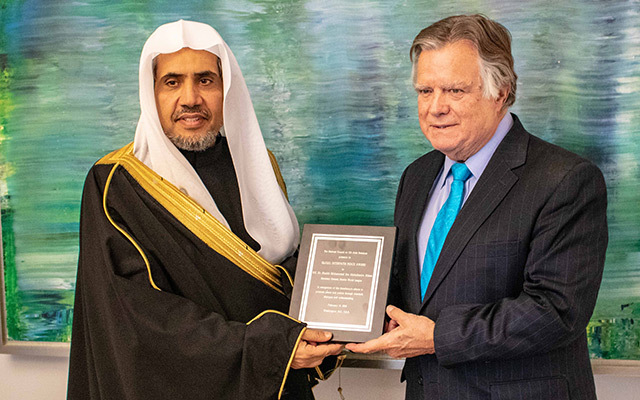 Washington, DC: On February 15, 2019, in Washington, DC, the National Council on U.S.-Arab Relations was honored and privileged to present its GLOBAL INTERFAITH PEACE AWARD to His Excellency Dr. Sheikh Mohammad Ibn Abdulkarim Alissa. The Award was conveyed in recognition of His Excellency’s efforts to promote peace and justice through interfaith dialogue and understanding. Muslim World League Secretary General H.E. Dr. Sheikh Mohammad Ibn Abdulkarim Alissa with National Council on U.S.-Arab Relations Founding President & CEO Dr. John Duke Anthony. Sheikh Alissa is the Secretary General of the Muslim World League, an international, non-governmental Islamic organization based in the Holy City of Makkah, Saudi Arabia. He is also Chairman of the International Body of Muslim Scholars. Sheikh Alissa additionally serves as the General Supervisor at the Ideological Warfare Center of Saudi Arabia’s Ministry of Defense as well as a Member of the Senior Scholars Organization in Saudi Arabia. Sheikh Alissa has hosted dialogues around the world to promote tolerance, co-existence, and peace. A leading voice for moderation, he lectures regularly in Saudi Arabia and abroad about Islamic jurisprudence and judicial theories as well as comparative legal and religious systems. He has authored numerous books and publications on legal, doctrinal, and human rights issues. 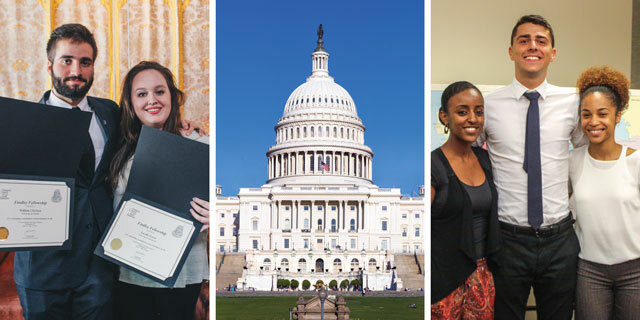 The National Council on U.S.-Arab Relations’ Washington, DC Summer Internship Program offers undergraduate and graduate students a ten-week professional, academic, and career opportunity internship in the nation’s capital. The program features a demanding mix of professional involvement, intellectual challenge, career exploration, and cultural encounters designed to provide interns with a rich and varied experience during their time in Washington. Professional work experience: Interns are placed with one of over a dozen Near East and Arab world-related organizations in Washington, D.C., where they are expected to work 35-40 hours per week under the direct supervision of their host organizations. Academic seminars: Interns take part in twice-weekly seminar sessions designed to provide them with greater depth of knowledge about the Arab world, to underscore the cultural, economic, and political diversity of Arab states, and to explore the intricacies of Arab-U.S. relations. There will be a particular emphasis, though not exclusively, on Arabia and the Gulf. 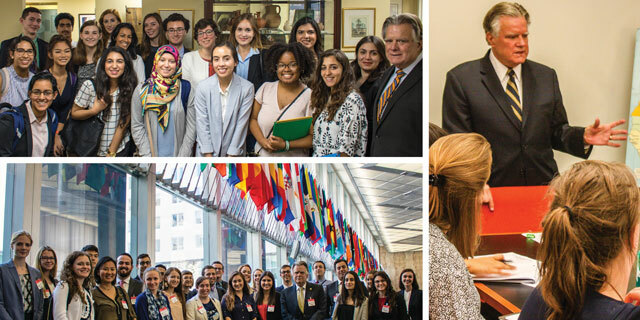 Site visits: Interns receive a behind-the-scenes look at many of the central institutions of federal government, national security policymaking, international diplomacy, and international business. to highlight the wide range of career opportunities awaiting those who aspire to work in the field of U.S.-Arab relations, as well as to provide counseling on graduate school and fellowship application processes. As complements to the program, interns will also be exposed to D.C. in a less formal manner via films, cultural events, embassy and museum visits, off-the-record conversations with former diplomats, group dinners, and suggestions for exploring the sights and sounds of Washington, D.C. This allows students to not only experience working in the city, but also encourages them to appreciate the experience of living in a diverse urban environment, and to take advantage of the exciting cultural, educational, and recreational opportunities available in the nation’s capital. The National Council on U.S.-Arab Relations is pleased to offer, through its Joseph J. Malone Fellowship in Arab and Islamic Studies Program, the Twenty-Third Annual Oman Cultural Immersion study visit to the Sultanate of Oman, February 22 – March 6, 2019. Fellows are required to participate in and complete a pre-departure orientation in Washington, D.C. to be held on February 20-21. This unique opportunity will provide a privileged first hand exposure to one of the Arab world’s most demographically, geographically, and socially diverse countries. The National Council is currently accepting applications to participate in this study visit. APPLY NOW! American professionals in academia, government, the military, non-governmental organizations, business, religious institutions, the media, civic associations, as well as the fine arts, humanities, and the social sciences are invited to apply. The Twenty-Third Annual Oman Cultural Immersion study visit will provide participants an educational experience that few Westerners and even fewer Americans have had. The program is choreographed to provide Malone Fellows an unparalleled diverse exposure to Oman – one of the most historically and culturally rich of all Arab and Islamic societies. Until relatively recent times, the Sultanate languished in its status as one of the most forgotten corners of all Arabia. Anyone in doubt about the extraordinary opportunity that being able to visit Oman in this manner presents need only consult any of the several National Geographic Magazine features on the country in the past two decades. End Pictures: inlaid Islamic niches at the Grand Mosque in Oman’s Capital Territory; Middle Pictures: Bedouin Omani girls in the Sharqiyyah Sands. a book review of Nadia Murad’s The Last Girl: My Story of Captivity, and My Fight Against the Islamic State. 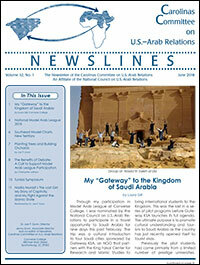 The full issue of CCUSAR’s Spring 2018 NEWSLINES is available for download through the link immediate below.